Before I go any further I would like to let you know that 4″ and 5″ Hollow Swimbaits have caught quality Blue Fish, Redfish, Sea Trout, Striped Bass, Walleye, Lake Trout, Musky, Pike, Pickerel, Smallmouth, Largemouth and Kentucky aka Spotted Bass. The word swimbait conjures up images of giant hunks of wood or hard plastic shaped like a trout and armed with multiple sets of treble hooks. They look cool, often weigh a ton and cost a small fortune. Those big intimidating ones are a category unto themselves however there are several others all of which have different capabilities and applications. There have been many innovations since the early 1990’s with an explosion of natural looking, ultra realistic hard and soft models swimbaits to choose from. 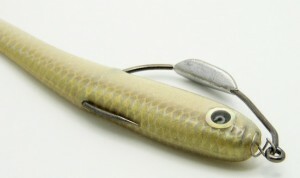 My focus today is the Hollow Swimbait which made a big splash on the bass circuit starting in 2007. Sure it had been used for years before secretly and with great success, but when a big time pro wins a major tournament or two or three with the same bait, that secret gets out in a hurry! 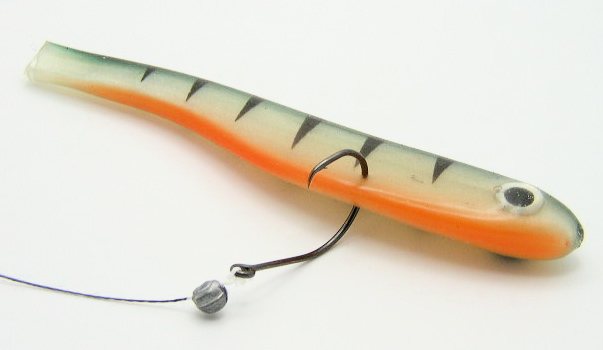 Why is the Hollow Swimbait so popular? It is unmatched by conventional hard Swimbaits because it can be fished through almost any kind of cover, around any kind of structure, at any depth, from early spring through late into fall. Another benefit to a soft swimbait over a hard swimbait is you won’t need special rods or reels to effectively cast them. Use a bait caster with 12-18 lb line coupled with a 7′ medium heavy rod action. As a result hollow swimbait have become a favorite of angles in all regions of the country for the last 3 years. Hollow Swimbaits are made of soft plastic just like the worms and tube baits which most anglers already use. It is essentially a tube shaped like a bait fish with a paddle tale. Largemouth, smallmouth and Spotted or Kentucky Bass are proverbial “pigs” when it comes to eating habits as many of us have experience by hooking fish half the size of our lure. A 12oz bass will attack it just as readily as a 12 pound lunker. Bass spend a large part of the fishing season, either in or close to some kind of cover or shallow water structure that is less than 10 feet deep. This would include a variety of live vegetation, fallen timber, stump fields, boulder flats, docks, sand bars and points. There are several ways to rig a hollow swimbait, each allowing the angler to effectively cover open water structure and varying types of cover. Regardless of which rigging technique you use, please pay extremely close attention and take you time making sure the any time your hook enters or exits the bait it is precisely centered. If entering the nose go in dead center, out the back or through the belly dead center. If you fail to do this your swimbait will not track correctly, it will roll on its side or helicopter. Consider this, if your car’s alignment isn’t right it won’t perform as it should and if your lure is not rigged straight it won’t have a desirable performance either. Weightless – You will be able to find several hooks for targeting fish in weeds and other vegetation. If you want to keep the bait at or near the surface with a slower more deliberate retrieve use and unweighted EWG style hook and rig Texas style like a worm (Owner Wide Gap Plus 6/0 are best). This is my preferred shallow technique covering weed flats and boulder flats and shallow stump fields. Texas Rig -You can add a tungsten bullet shaped weight on your line so that it rest against the nose of the bait if you want get deeper. Weighted Hook – Another popular hook style is a weighted EWG or a nose screw lock hook. These hooks have varying amounts of lead molded onto the hook shank. Increasing the amount of weight will allow you to fish the bait at a faster speed or great depth if that’s what the fish want. This is a great way to hit deeper weed edges, ledges and submerged structure. When fishing more open water areas with little or no snags you can go with exposed hook rigging. Insert weighted hooks like jigs as seen in the photos or use a new innovative product made by KSH called the Original Bait Weight. 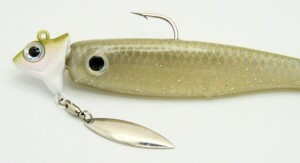 This weight gets inserted through the belly of the bait and pushed as far forward towards the head as possible, then pushed up through the top of the head. The opposite end of weight has a split ring to attach a treble hook. If you have caught a few fish and damaged the nose of your swimbait don’t throw it out. Cut off the paddle tail section and rig the middle diction of the bait with a circle or octopus hook, add split shot and you have a great wacky style bait. Throwing this around docks, flooded trees or at bass busting shad on top and you have a very realistic dying shad presentation. I cannot comment on the effectiveness of the soft plastic swimbaits that you might have purchased and tried to use in the past. I can only advise you t make sure that you look for a thin body and soft plastic consistency. I would recommend my Hippo Tackle Hollow Core Tube Swimbaits, Berkley’s Hollow Belly Swimbaits or the original Basstrix Swimbaits. The rest are thick, tough and lack the required action to be effective. The last tip I can give you is to spend more than 10 minutes throwing these baits adjusting your retrieve depth. Tie one on fish it for at least 40 minutes each time you hit the water, it will be well worth your time and effort. Special thanks to Craig Toerien from Hippo Tackle for sharing his knowledge of soft plastic swimbaits with everyone here at FishPittsburgh. This is great information, especially the wacky rig swimbait idea. In the past I would toss my swimbaits once the nose was ripped. I agree Tom. I have never wacky rigged a swimbait before. I have done it with a fluke so i’m sure it would work. I will give it a try this year for sure. I heard a few readers ask why remove the paddle tail for wacky rigging? Well if you leave the tail on it causes the bait to fall head first, that’s not as effective as a horizontal fall like a Senko. You can get an even more natural fall if you hook my bait through the side (lateral line) not the belly which imitates a dying shad listing over on it’s side as it spirals down through the water. The side of the swimbait has a lot more surface area which aides the natural falling action.